One characteristic which all great sounding pianos have in common is that they possess a rich, vibrant bass. A strong, resonant bass brings the music played on a piano to life. Unfortunately, as an instrument ages the bass strings which give the piano its musical heartbeat tend to deteriorate. Gradually, over the decades, the tone of the typical acoustic piano loses some of its original luster, and the instrument may come to have a bass sound which is “tubby” and not strong and vibrant. At this point, replacement of the factoryinstalled bass strings is in order. If the bass section of your piano has gotten to the point where it sounds tubby the installation of a new set of bass strings would benefit your piano tonally. Installation of a new set of bass strings in progress. When bass strings are new and performing as intended in a piano, how are they able to achieve such deep and vibrant tones? heavy strings pulled to a high degree of tension. To show how remarkable the design of a piano is, consider the fact that while the powerful lowest note on the piano keyboard vibrates 27 times per second, the strings for the highest note are vibrating at an incredible 4186 times per second! If the low A string was compared to the heart of an elephant, the strings for high C might be compared to the heart of a hummingbird! The piano is a remarkable instrument! 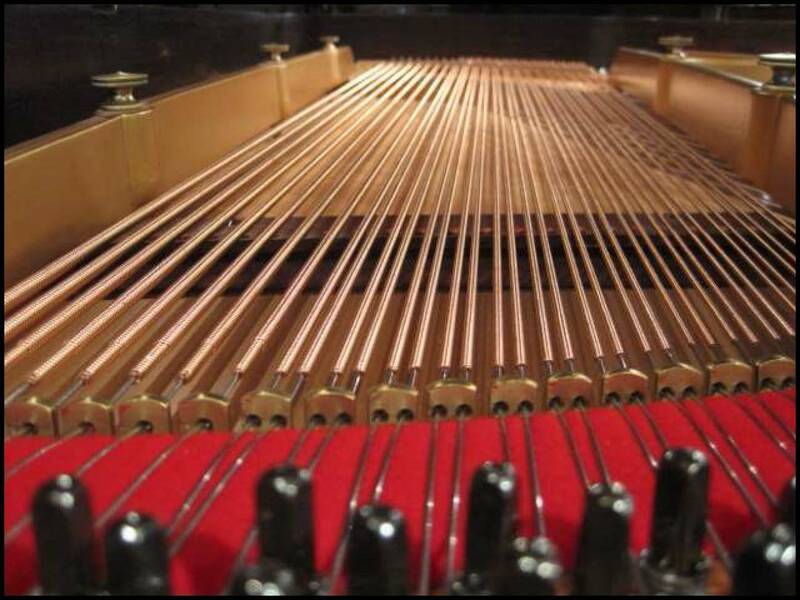 While the uppermost strings of a piano are as little as two inches in length, the bass strings stretch diagonally inside the case of the piano to take advantage of the entire inner dimensions of the instrument. To give bass strings the additional mass needed to slow their rate of vibration even further, the steel core of each string is wrapped with one or more layers of copper windings. The steel core gives the string its strength and allows it to be pulled to a high tension. The copper, being a softer metal, does not impede the free movement of the string—producing a rich, longlasting tone not otherwise possible. When one of these long, flexible bass strings is set into motion by the blow of its corresponding hammer, the combined factors of the mass of the string and its high tension will cause it to vibrate for a long time. The sustaining power of the lowest notes of the piano is remarkable when compared to the very brief vibration made by the highest notes with their much lighter strings. What causes the degradation of tone over time in a set of bass strings? Simply put, old age—strings wear out. 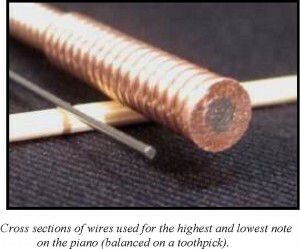 First of all the copper windings of the bass strings, which are put on at tension during manufacture, lose some of their tension over the lifetime of the piano, making the strings less vibrant. The steel piano wire which forms the core of each bass string also becomes brittle with age, making the strings less responsive and more susceptible to breakage (this factor also affects the treble strings of the piano as well). Finally, the crevices between the windings of the strings tend to become clogged with microscopic dust particles which resist vacuuming or even blowing out with compressed air. 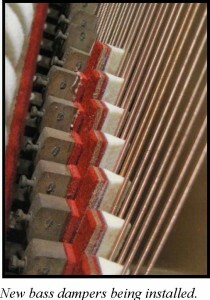 It is important to note that the tonal quality of any piano is not only affected by the condition of its strings. The amount of responsiveness left in the soundboard and the condition of both the hammers and the bridges are other factors which should be taken into account. Of course, even when pianos are new differences in design will result in significant differences in tone. The goal is to bring your piano up to its potential in terms of its bass tone. Are bass strings an “off the rack” item? specifically for your instrument. There are a variety of factors which make this necessary. For one thing, different pianos will have different numbers of bass strings. (The smaller the instrument, the more wound strings it must have to compensate for the shorter length strings.) 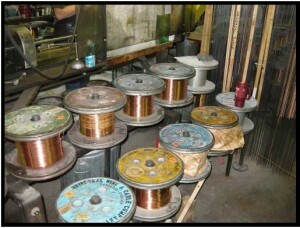 Strings vary as to the thickness of the steel core, the length and gauge of the copper windings, and the number of layers of windings. With certain wellknown models of instruments (such as a Steinway M grand, for example), string makers have what’s known as the “stringing scale” and will be able to make your fresh set of strings as soon as a phone call is made. With other pianos, it is necessary to ship the old strings to the string maker, so that measurements may be taken to duplicate the original set of strings. 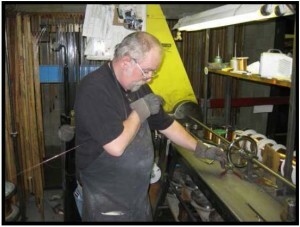 A bass string manufacturer (there are several highlyreputed shops to choose from depending upon the needs of your piano) must have a complete inventory of both the gauges of steel core strings and also the diameters of copper windings which are used to “load” the strings. The precision equipment used at the string winding factory ensures that the new set of strings will be wound with the same degree of accuracy as the original strings which came with the piano. The hand winding of the double wound strings is a skill which takes years to master. 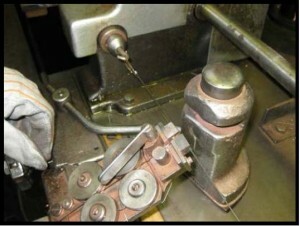 Here, a journeyman string winder applies just the right amount of tension to make a great sounding/ looking string. If the string maker has the stringing scale for your piano, the order could be placed for the new set to be manufactured before anything is done at the piano. When the strings arrive, the old strings may be removed, and the new strings installed, usually in the same day. If the stringing scale is not available the old strings would need to be removed from the piano, bundled together and sent to the manufacturer for measurement and duplication. 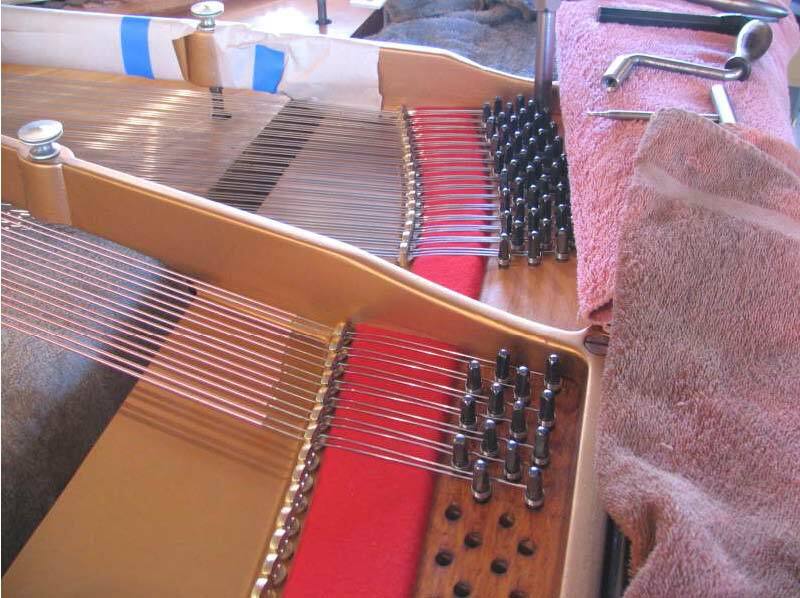 When the new strings were returned (photo to right), they would be installed in the piano in your home or in the workshop if more extensive work (such as soundboard repair or pinblock replacement) were being undertaken at the same time. Are there other related jobs which should be considered at the same time? The condition of the soundboard, the quality of the hammers and the integrity of the bass bridge all need to be factored in as well. Since these components influence the tone of not only the bass but also the piano in general, any suggested repairs should be considered to achieve the best results. An important job which goes hand in hand with bass strings replacement is the installation of new bass dampers. 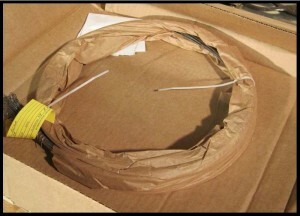 Since the old dampers will have conformed to the shape of the original strings windings, it is unlikely that they work efficiently with new strings. New high quality dampers will provide the quick cessation of sound when notes are released. Finally, the replacement of the upper steel strings as well as the bass strings might also be considered. While the tonal quality of the steel strings is less likely to degrade over time, they do tend to rust and become brittle with age. If they are ever to be replaced, the best time to do it is when the bass strings are out of the piano, since many of the steel tenor strings run under the bass strings. A newly installed set of bass strings in a 125 year old Weber grand gives the piano a rich bass sound once again.